The Guide to Guest Services™, The Guide to Emergency Preparedness™, and The Guide to Infection Control™ are fully customized information directories for your hospital or healthcare organization. Because of the durability and protection of the vinyl folder and clear polypropylene pockets, your Guides will last many years. The printed cards can be removed and replaced when changes are needed. You will be helping the environment by eliminating thousands of pounds of disposable literature. There are a wide variety of vinyl colors and textures to choose from, and we can produce guides using full color processes that allow us to match your PMS color(s). This allows you to select vinyl and ink colors to compliment your organization's colors or room decor. Need help deciding which guide is best for you? Call us at 1-800-637-8525 or send us a message today! The Guide to Emergency Preparedness™ is a quick reference guide that helps keep your staff prepared for emergency situations such as bomb threats, fire emergencies, child abduction, and system failures. Because it is completely customized, the Emergency Guide allows you to convey information specific to your safety policies and emergency procedures. With the Guide's unique appearance employees will have no trouble locating the Guide and the information they need. The Guide to Emergency Preparedness™ is a quick reference guide for emergency response personnel. This guide will keep important information in an easily accessible location. Because this guide is extremely durable, it can be taken to an emergency site and will not be damaged by the conditions a responder typically faces. The guide can withstand temperature extremes, rain, snow, and hail. The Guide to Emergency Preparedness™ is a quick reference guide that helps keep your staff prepared for emergency situations such as bomb threats, fire emergencies, and system failures. Because it is completely customized, the Emergency Guide allows you to convey information specific to your safety policies and emergency procedures. Employees will have no trouble locating the Guide in urgent situations due to its unique appearance. 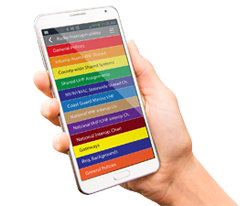 The MY EOP™ mobile app for iPhone and Android that gives you access to a quick reference guide that helps keep your staff prepared for emergency situations such as bomb threats, fire emergencies, and system failures. 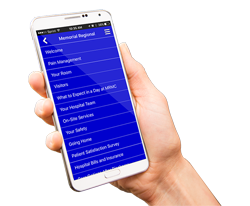 The Our Services™ mobile app for iPhone and Android allows patients and their loved ones quick and easy access to your hospital's unique information using their personal mobile device. See for yourself why our products get rave reviews by all our clients! Because of the durability and protection of the vinyl folder and clear vinyl pockets your guides will last many years. Our guides also help the environment by eliminating thousands of pounds of printed literature waste. "Everyone from physicians and nurses to housekeepers and food service workers has been praising it as the best tool they have ever seen."